The 49th annual BIGFOOT DAYS celebration in Willow Creek went off swimingly as the small town community event that it is. This year's theme was "Stompin' the Trinity with Bigfoot." A veterans' color guard led the way as usual, followed by the Willow Creek Volunteer Fire Department's and Forest Service's trucks, Smokey the Bear, a kids' Ju Jitsu clan, belly dancers, fancy souped-up classic cars driven by grownups and mini cars piloted by kids, some floats of varied themes, the Little Miss and Mister Bigfoot winners; and yes, Bigfoot did make a few appearances in the parade. There was even an appearance of the Sasquatch costume of infamous Georgia Gorilla note, this one fully animated, not frozen in ice with guts tossed on top. Some cute Bigfoot suits and masks were presented on floats, a wild guy in a gorilla suit ran through some antics, and even the Ray's Market folks were shown providing "groceries" for a Bigfoot's Breakfast, complete with giant boxes of cereal and milk. Down in Veterans Park the usual festivies ensued. There were plenty of Indian Tacos, buffalo burgers and sno' cones, plus the usual knick-knack and craft sellers, even a foot reflexologist. Not much Bigfoot presence appeared this year, however, but there were some enterprising youths selling their new Bigfoot Maps in a nice new adaptation and revision from the older one you may have seen around. Also, the "Messin' with Sasquatch" character appeared to promote Jack Links. Here anyone could appear to be abducted by Bigfoot, as did yours truly. 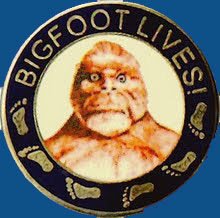 A couple of tables had new Bigfoot merchandise items, a Bigfoot Poster and some "I Love Bigfoot" hats, as well as another with t-shirts reading "You know what they say about men with Big Feet." Missing this year was old "Mr. Bigfoot," Al Hodgson. We are hoping all is well with him and his family. 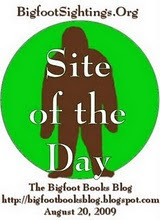 Also missing was a presence from the Willow Creek-China Flat Museum, home of The Bigfoot Collection... what's up with that? We here at Bigfoot Books had put in some effort to rally the troops for a Bigfoot speakers presence this year, but apparently the planners had too much on their hands to make provisions. The festival is in a kind of transition between the retiring old guard and a new, younger group of organizers. They all have families and jobs, so heck, I guess Bigfoot isn't too angry they didn't get back to us. Maybe NEXT year we will have to try for a mini-conference in the VFW Hall? If any of you are interested in attending or speaking at such an event do let us know ASAP so that we may put in the necessary lobbying and planning to make it happen. But darn, this year we could have had Loren Coleman, Dave Paulides and Sean Fries, not to mention HSU biologist (yes, he is a believer) Richard Stepp! Heck, yes, let's do it next year, EH? It will be the grand 50TH ANNIVERSARY of the fest, so let's put it on! This thing is almost as old as the Jerry Crew footprint casts, by gum, dag nabbit. All photos copyright Steven Streufert, 2009. You may use them for non-commercial purposes if you give credit and hopefully email me to let me know where they will appear. All links to this blog are greatly appreciated. COMING SOON: From Bald Hills to the Redwoods and the Sea, another squatching research expedition.